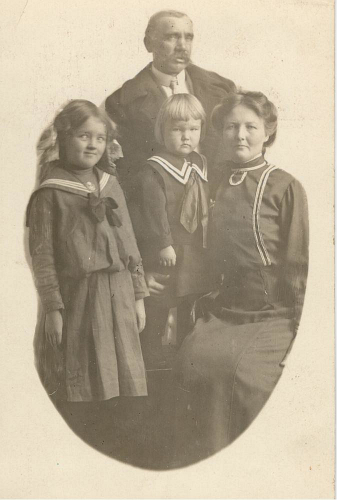 Ester (Anderson) Moe came to Whidbey Island in 1906 as the one-year-old daughter of Bertine and Anders “Graveyard” Anderson, well known Langley pioneers. Bertine had emigrated from Norway, and Anders from Sweden. Her parents were living in Great Falls, Montana where Ester’s father worked at a mine smelter, when Ander’s aspiration of being a farmer farther west won out. They took the train to Seattle, where they saw an advertisement of land for sale on ‘Whidby’ Island. 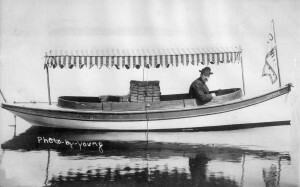 After taking a boat ride to Langley, he purchased 20 acres from Langley founder Jacob Anthes. Ester often referred to herself as the gravedigger’s daughter. Why her father’s nickname? 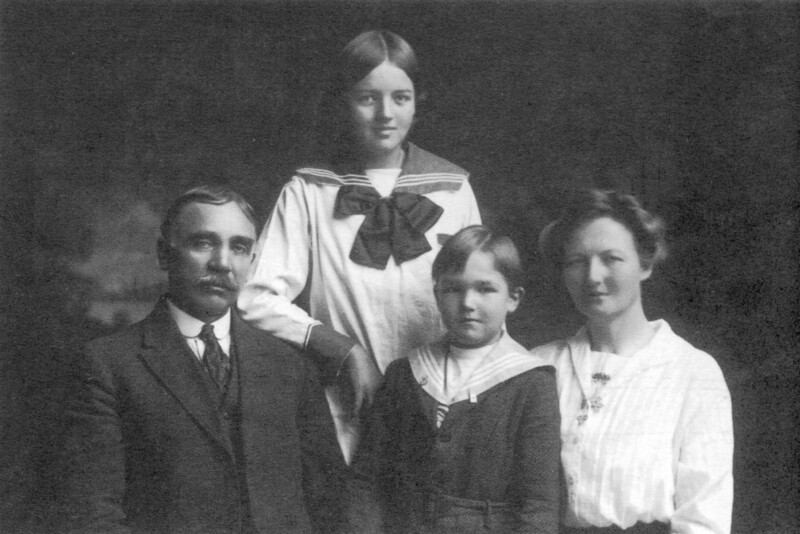 There was another Anderson family in Langley, and to differentiate the two men, they were called by their occupations: one was Anton “Blackie” or “Blacksmith” Anderson, the blacksmith. 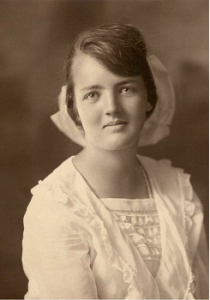 Ester’s father was called “Graveyard” Anderson because the family lived adjacent to the new Langley Woodmen Cemetery and her father dug graves and was the caretaker there. Ester lived most of her life on south Whidbey. She taught at Deer Lake School in Clinton, was the Secretary for the Clinton Progressive Association, taught Sunday School and was choir director at St. Peter’s Lutheran Church, and served as the Clinton Postmaster for 29 years. The local chapter of the Daughters of Norway was formed in 1995 and is named the “Ester Moe Lodge” in her honor. 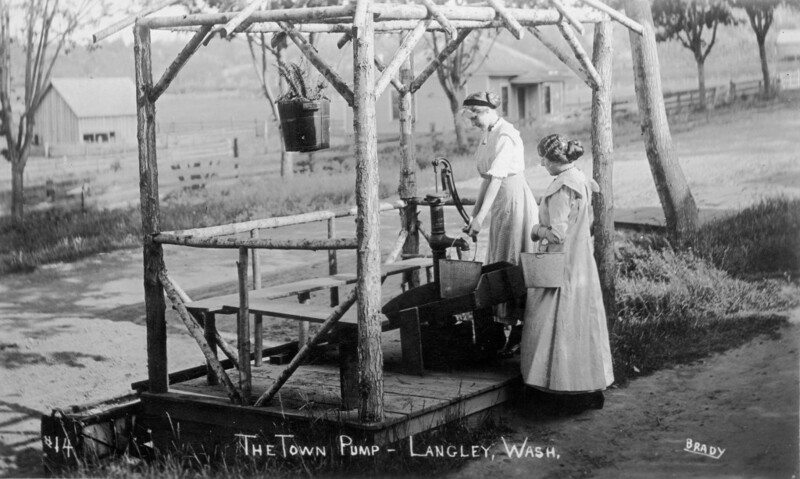 “Langley was as large in 1906 as it is today in 1976. On the waterfront side of First Street were two hotels. The building which is now the Dog House Tavern was the general store, post office, and pool hall; upstairs was the big hall with a lovely floor and big stage. In the basement was the town gymnasium. The school used the gymnasium for many years before one was built on the school grounds. Mr. Henry Weber was the butcher. He was a German immigrant and had an excellent meat market (“butcher shop” we called it). Mr. Foster was the barber. Then there was the village blacksmith, Anton Anderson. Everyone called him “Blacksmith” Anderson. His first shop stood where the Methodist Church is located. I loved that blacksmith shop. People came from Bayview, Maxwelton and Clinton to have their wagon wheels repaired and their horses shod. It was always warm there, and he had a little room with a cot, table, a few chairs and a stove. The coffeepot was always on the back of the stove and a few goodies were on the table. On the wall was a picture of many kinds of fish. I knew the names of all of them. Blacksmith Anderson was also quite a fisherman. He knew where all the rock-cod beds were located and the red-snapper’s homes. Then there was a large livery stable, where Mr. Brehm had horses for rent and he delivered freight which came by boat. The large wagon was also the hearse at funerals. Later, there was a second blacksmith’s shop. Across the street was another store, where Clyde’s Garage is now located, and the parsonage with a huge pink azalea bush in the yard. The only church in Langley was the Friends Church on upper First Street where the Bucklews now live. On Anthes Avenue was a bank, Langley State Bank, a telephone office, Funk’s Mercantile, the High School, Uncle Hughie’s (Hugh McLeod’s) Lawyer’s Office, a creamery, and the town pump. It was built like a little pergola with seats around the sides, a pump in the middle, and the old tin cup. It was quite a gathering place for old and young alike. No one had running water in their homes. I stopped there many times to get a drink. No one thought of germs; I guess the air and sunlight killed them all. We also had a doctor, Dr. Craig, and a real estate office. 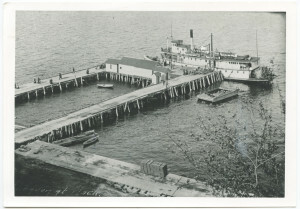 At the foot of the hill was the Langley Dock. It was built in the shape of a “U.” You could drive out with your horse and wagon and back on the other side. I drove old Prince down there many times with a wagon of crates of strawberries to be shipped to Everett on the boat. At the open end of the U-shaped dock was a little confectionery called “The Sea Breeze.” Phil Simon owned this little store and his home was across the road. It sure was a treat after walking from the farm to the dock to have an extra nickel for an ice cream or a box of Cracker Jacks. 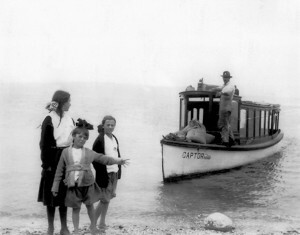 Phil Simon owned two launches, “Captor” and “Caprice.” He would take groups of people to Camano Island or Hat Island for picnics for a minimal fee. I can remember going with my parents on one of his launches to Everett to hear Billy Sunday (a popular evangelist). So even though we had no cars, no ferries, no Deception Pass Bridge — we were not completely isolated. Ted Howard had the first car in Langley. He certainly was kind. Every day after school, he would take a few children for a ride. When your turn came, what a thrill! He ran a taxi-service for many years. He met all the boats, and if you had an extra quarter, riding was certainly easier than walking. A boat made two round trips to Everett daily. The boat landed at the city dock at the foot of Hewitt Avenue. I was not very old when I could go to the dentist (in Everett) by myself. Another boat made one round trip a day to Seattle. These boats carried freight, mail and passengers. The Seattle boat left Oak Harbor at 6:30 a.m. and made the following stops — San de Fuca, Coupeville, Saratoga, Mabana on Camano Island, Langley, Clinton, Glendale and Possession.